Splash-N-Swim Child-Sized Swim Masks Goggles Assortment! (Set of 4) Plus Bonus "Safety First" Summer Essentials Pack! Huge Savings Item! Save 16% on the Splash-N-Swim Child-Sized Swim Masks Goggles Assortment! 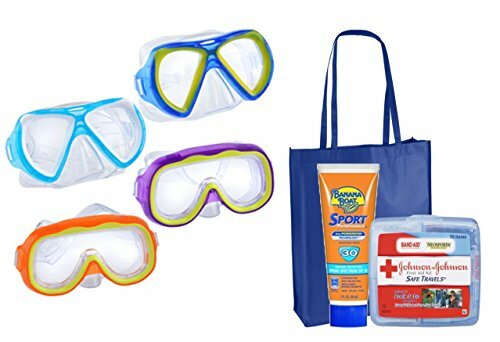 (Set of 4) Plus Bonus ''Safety First'' Summer Essentials Pack! by Grennbrier Int at Wander Soul. Hurry! Limited time offer. Offer valid only while supplies last. Feel the need to hold your nose every time you are under water? Swim masks allow you to see under water while keeping both arms free to swim about. Perfect for helping kids learn to swim as well as paddling around the pool or snorkeling at the beach. (4) Splash-N-Swim Child-Sized Swim Masks - assorted among the 4 color combinations shown. Ages 6+. If you have any questions about this product by Grennbrier Int, contact us by completing and submitting the form below. If you are looking for a specif part number, please include it with your message.